The emancipation from stupid trail planning. An extreme internet research which lasted maybe ten minutes told me the following: Yes, the Strada Alta in the Leventina is a popular hiking trail for people who don’t like hiking that much that they consider going more than five miles per day and no, it doesn’t get much better on the last part of the Leventina. However, own map research and a two minutes internet research brought an alternate to the light. There is a parallel path just 500 meters higher up the mountain. Yes, please! Those who skip these 500 meters don’t know what they miss. It is the most beautiful trail I ever saw since the start of my real hiking career in 2016. There were nice parts also in the Jura and on the Via Alpina but never before lasted such a nice trail for miles. Yes, there are fewer restaurant along the way, yes you need to do a little bit more uphill initially, but the path, the SURFACE, the views and the absent of the road noise make it all worth it. The planers of this trans-swiss-trail are horribly wrong. Hikers are not hiking because they need hotels, stores & restaurants at least every mille. Hikers are not willing to walk days on asphalt and concrete for the peace of mind to find store every time they run out of water. Hikers are able to leave the trail, if they need a hotel room or a resupply. I do really think that those planers never hiked for a longer period of time. There is only little road noise on the alternate. Depending on the topography, most of the times there is no road noise at all. Which is good – again, the presence of road noise keeps people from a trail. Only people that are on-trail in the first place can spend money along the way – so, dear planers, if you reroute the trail through nicer terrain, more people will hike it and they will spend more money than those masochists willing to hike the current route. A better route will attract more people. By the way, my alternate isn’t extreme hiking, you don’t need a load of experience to do it, it is not more dangerous than central park. 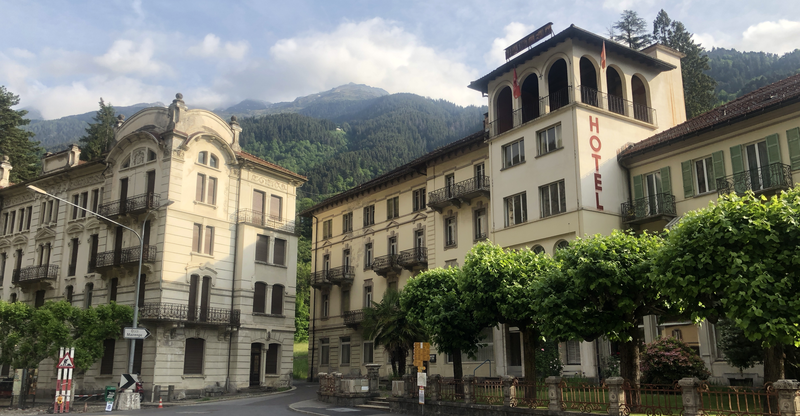 Yes, you must be able to walk two hours without seeing a store or a restaurant but if you can’t do this, you will not hike in the Leventina anyways as it is kind of remote from big centers like Zurich (at least for people in Europe). My day starts as usual on 4.30 in the morning, so I am in Faido at 8.30. The uphill to the original trail and the 500 meters extra took me maybe two hours. I still can climb. There are goats and cows along the way or on the way. I spot a lovely deer munching fresh leaves just about 10 meters above me. And there are views. Some serious mountains. I cross alps where the mountain tanker season hasn’t started yet or where there will be no more cows since the farmers don’t send cows there anymore. Open patches without cows are incredibly beautiful but of course the forest takes the land back. The day ends in confusion however. I forgot to check out all the connections I would have needed to my sister’s house where I had prearranged a bed for the night. So, she has to hop in her car and drive over the Lukmanier pass to get me. She takes it with humor but on the way back over the pass she tells me, what she did together with her little boy and her husband and I feel a little bit sorry for her. She isn’t such a spontaneous person and she likes to plan in advance, so I clearly interrupted her possibly careful planed day. I tell her from my plans for tomorrow and she ask me if I’ am not afraid that it may be a little much? It isn’t, it is less than I would love to do – I have to report for kitchen duty the day after at 10 in the morning, so I can’t risk walking through the night like I did going from Zurich to Basel. Also, I am not afraid of fresh air or a little rain here and there. She even keeps her boy awake longer than his usual bed time. However, my day is cut short. I would have 4 more hours to Olivone on my path high up above but with all these constraints I have to basically run down the mountain to Aquarossa. My sister owns a diesel-powered car and it is actually fun to drive over the pass although my sister drives extremely moderate. I am happy that I don’t drive myself. I could never ever restrain myself to drive according to the law. I would more drive like Walter Röhrl and this would endanger everybody else on the street and nearby. 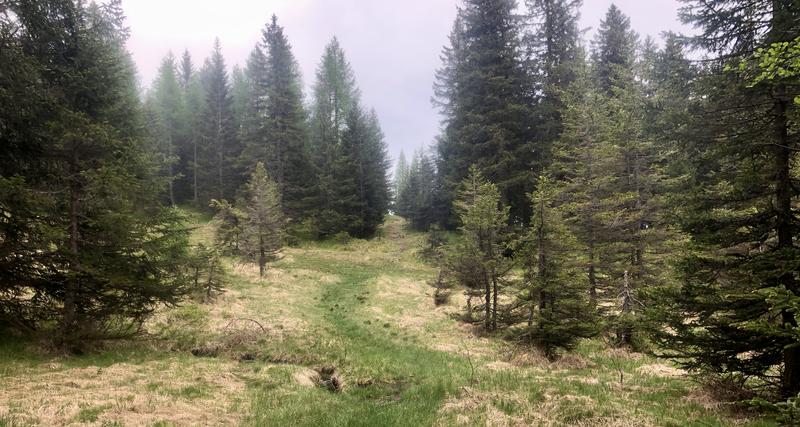 As I was in Biasca before and because my alternate was longer than the original path I consider the Trans Swiss Trail to be done.